The transsubstantiatio.tumblr.com site collects sounds as images: tracks of audio that are, quite simply, opened in an unexpected and unintended computer program. A source file encoded so as to be heard is instead transferred through that which is meant to be seen. Up top, for example, is the resulting visualization of a track by Nine Inch Nails, “Pinion.” The Tumblr appears to be a sibling site to the soundcloud.com/null66913 account, where the latest track appears to take the opposite course (this is all based on interpreting a page originally in Spanish and itself computer-rendered in a different language, in this case English, courtesy of Google’s Translate service). The track appears to be the sound of an image. What image, I can’t say for sure. Perhaps someone else can be of assistance. 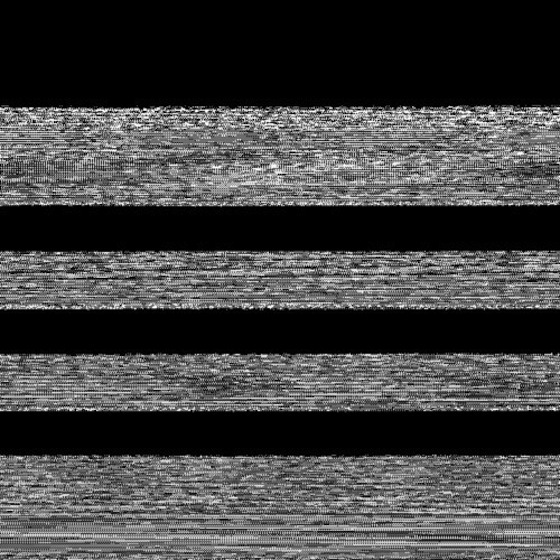 The result, nonetheless, is striated noise. In the mind’s eye, it’s the fuzz of a dead channel. I wonder what the channel would show if it were properly dialed in. More (in Spanish) about the move from sound to image to sound at mediateletipos.net. More on null66913 at null66913.net and twitter.com/null66913. All images in transsubstantiatio.tumblr.com are generated saving the original sound file (mp3, aiff, wav or whatever) as raw and then opening the raw file in a image editing software. The track is a screen capture (jpg or png, I don’t remember) of mediateletipos home page saved as raw in Photoshop and then opened in Audacity.